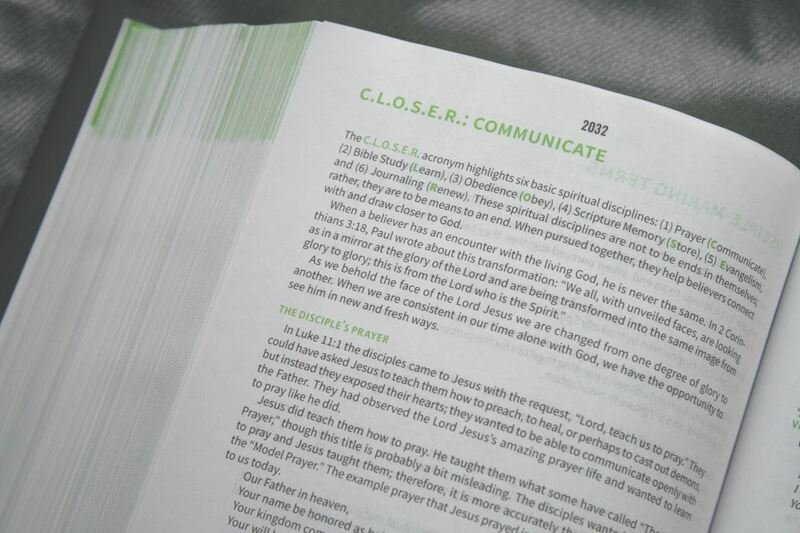 The CSB Disciple’s Study Bible is a discipleship-themed study Bible from Robby Gallaty of Replicate Ministries that leads readers through studying the Scriptures and provides writing space for them to answer questions using the H.E.A.R. method. It includes specially chosen readings, called the F-260 plan, for 260 days of the year. 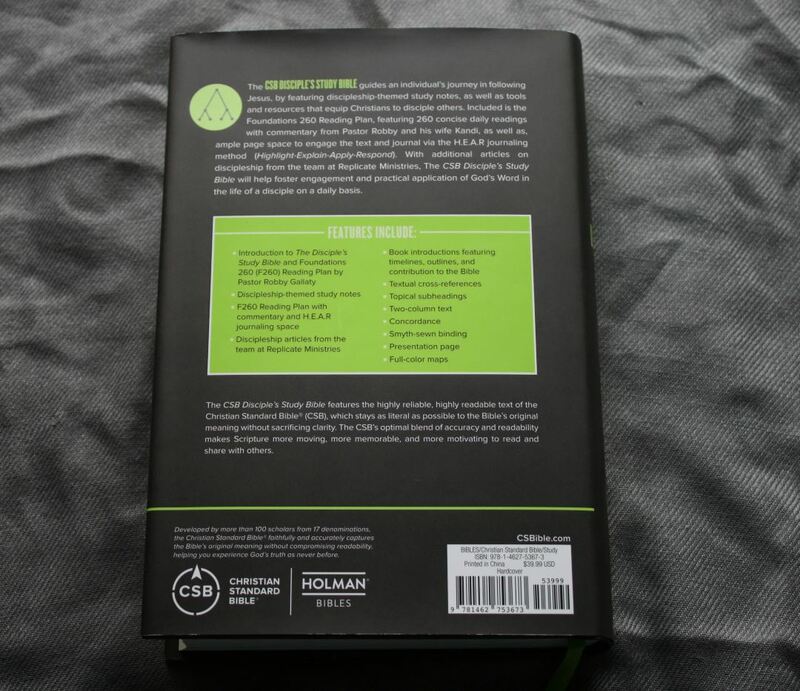 I’m reviewing the hard cover edition, ISBN: 978-1-4627-5367-3, designed and typeset by 2K/Denmark, made in China. 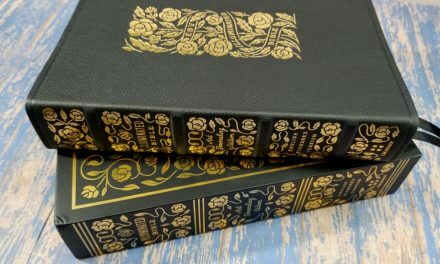 This edition is hardcover with a dust jacket and sewn text-block. It seems well-made. The paper is probably upper 20’s to 30gsm, but that’s just a guess. It’s not the same paper in the Spurgeon Study Bible. It’s very opaque for how thin it is. 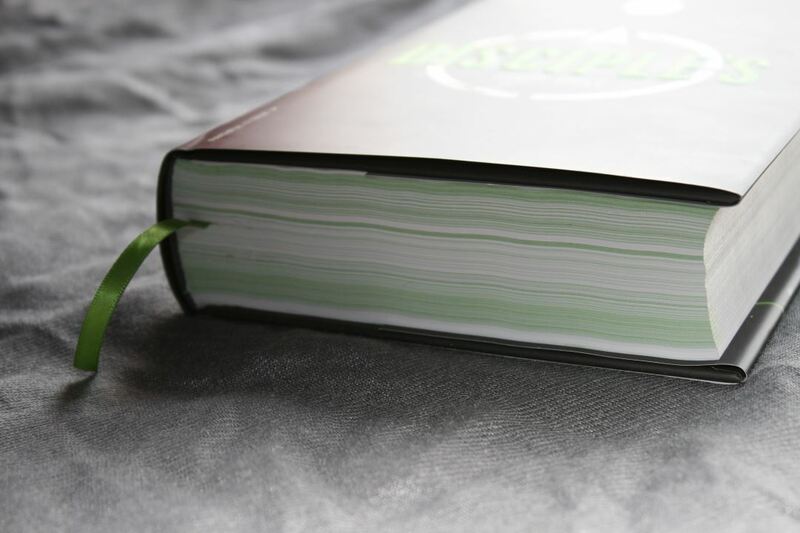 I prefer the thicker paper, but it does have 2144 pages, so it makes sense that it would use thin paper. The only complaint I have about the paper being thin is it’s not the best choice for writing the notes that it leads you to write. 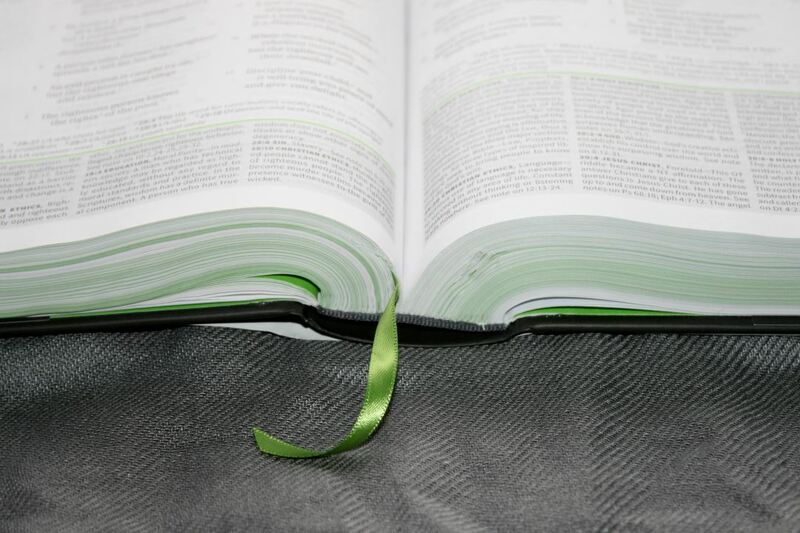 It includes a long green ribbon that matches the green highlights used in the Bible. The overall size is 9.25 x 6.25 x 1.8″ and weighs just under 3lbs. The text is presented in double-column paragraph format. 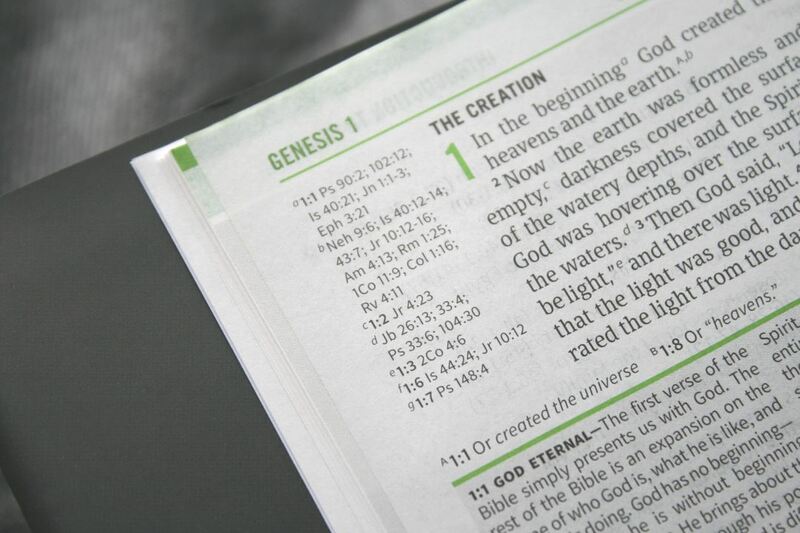 Cross references are placed in the outer column and footnotes are placed at the bottom of the page in three columns. 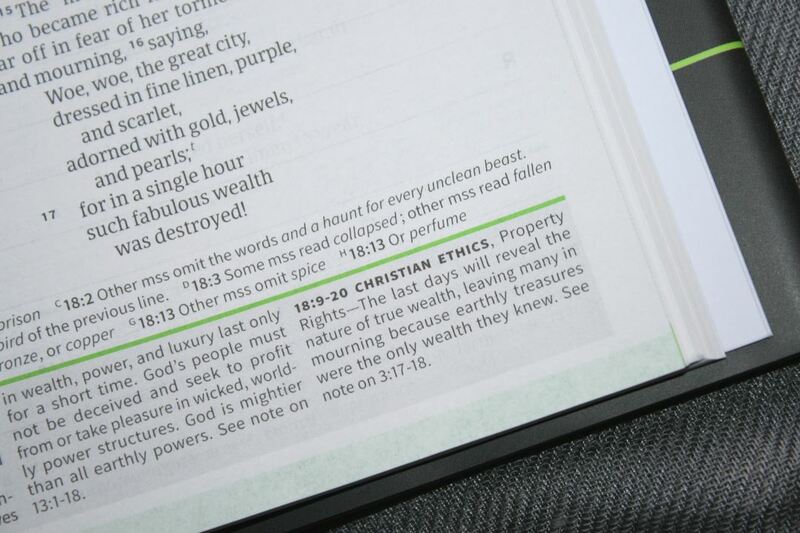 The footnotes are printed over a gray background so they stand apart from the text. Green highlights are used throughout. The header displays the book name and chapter number in the outer margin and the page number in the center. Translation footnotes are placed under the text. The typeface is black letter in 9-point. The 2K/Denmark design is clean and easy to read. 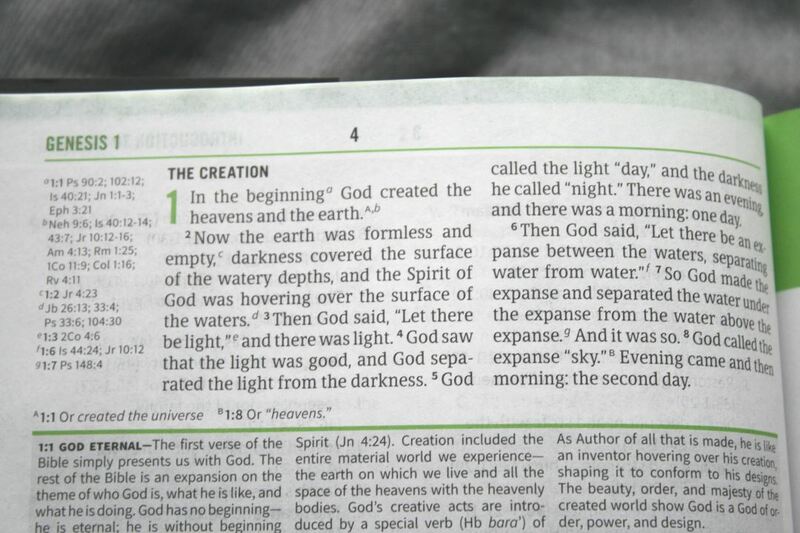 It doesn’t say that it’s their Bible Serif, but it does look like it to me. It has 34-36 characters across with around 7-9 words per line. 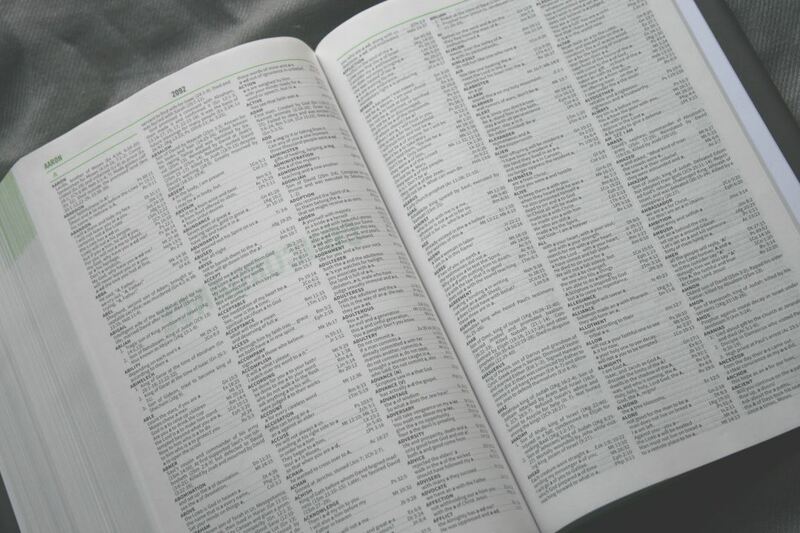 References and footnotes are keyed to the text with letters and numbers. I found them easy to ignore while reading. Verse numbers stand out well enough to find them quickly. Book introductions take a couple of pages and have some unique features. 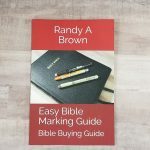 They cover the expected material – circumstance of writing (author, background), contribution to the Bible, structure, and outline. This is well-written and provides enough detail to give a basic overview of the book. What’s unique is that each book has a historical timeline. This is placed at the bottom of the page and covers a couple of pages. It provides a timeline with dates and key events that lead up to the point of writing. 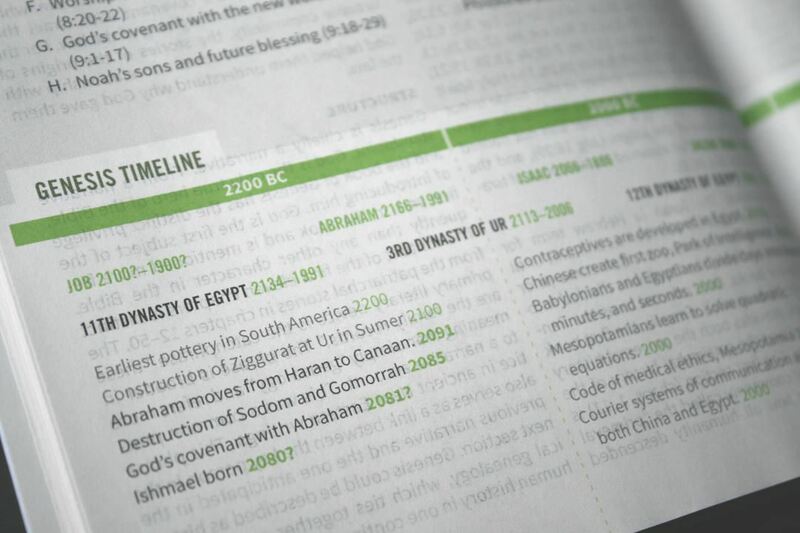 For example, the timeline for 1 Corinthians starts at 1000 BC and gives the history of Corinth. It ends at 100 AD and discusses what happens after the Apostles. 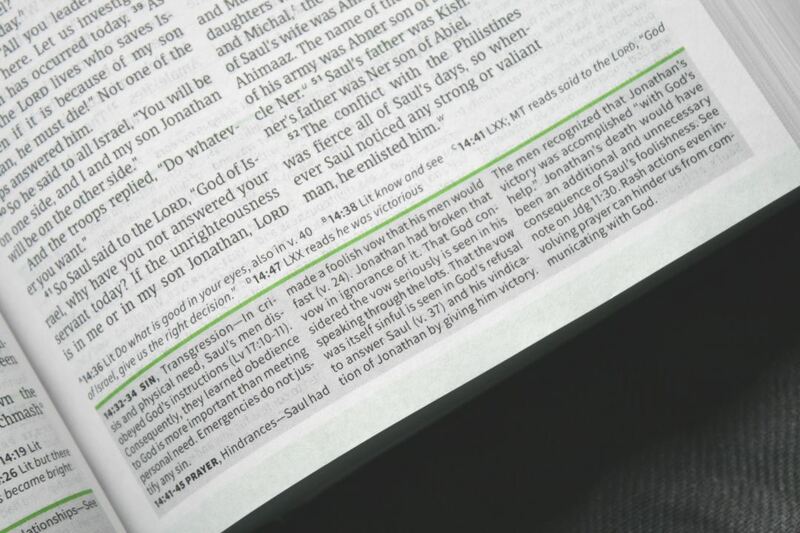 Verse-by-verse commentary is placed at the bottom of each page in three columns of small text. 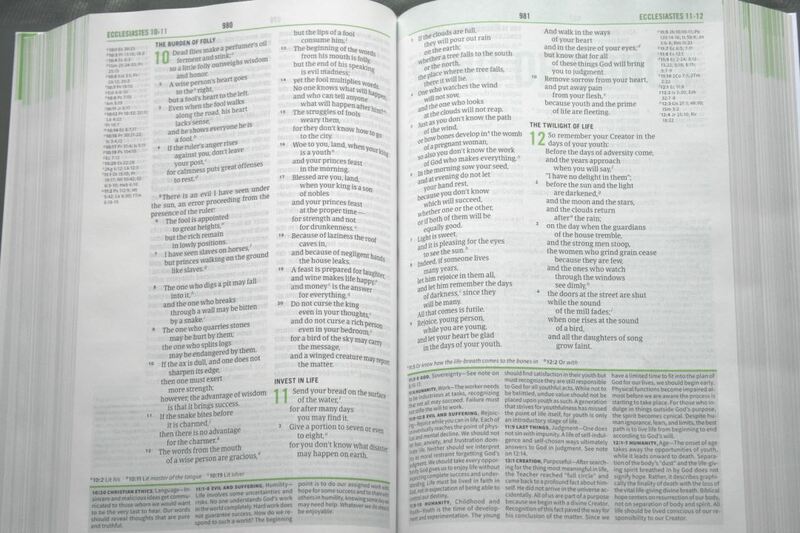 They include the chapter and range of verses they correspond to and also provide the topic in bold. This can look confusing if you’re looking for where a specific phrase is covered, but by identifying the topic lets them break up the commentary into chunks. It has a lot of commentary. As always I recommend you use the commentary for reference and do your own study, allowing Scripture to interpret Scripture. References are placed in the outer margin and are identified only by a letter. I was impressed with the number of references. 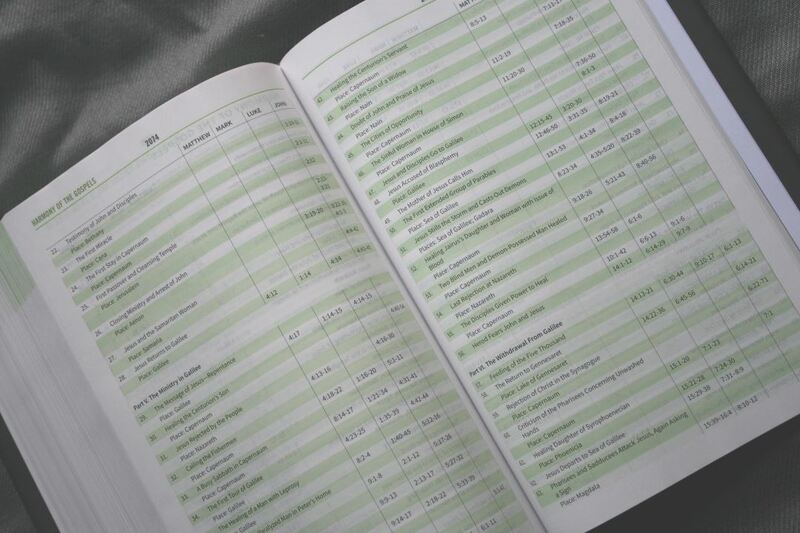 The reading plan is the F-260 plan. 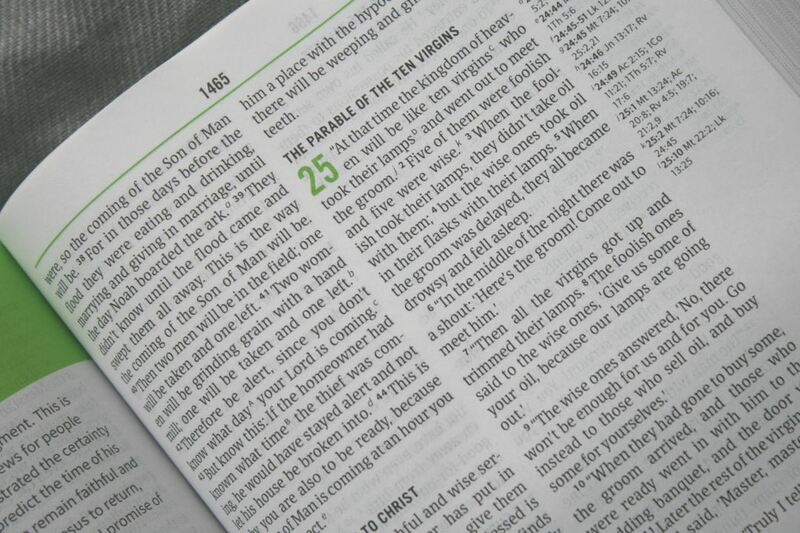 It gives 260 days of reading to read most of the Bible through in one year in chronological order. 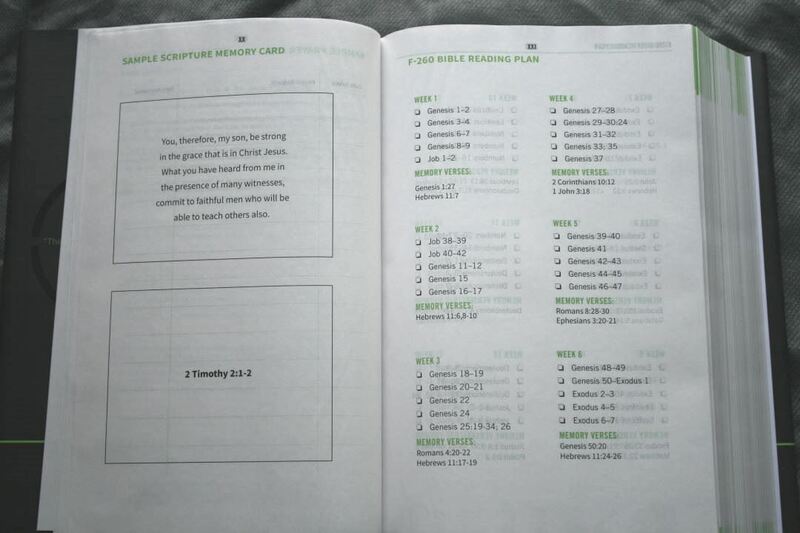 It provides the week number, five readings with boxes to check when you’ve completed the reading, and memory verses. 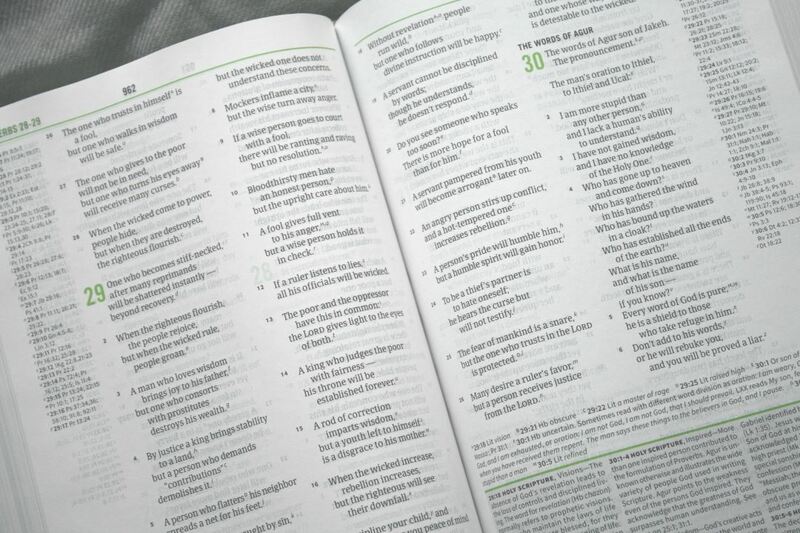 The reading plan highlights the main points with a focus on Israel leading, to the coming of Jesus, His teachings, and the Apostles’ instructions to us. It also gives instructions for using it including reading it Church-wide and as a tool for preachers to use it in the pulpit. It even provides a website for preaching examples. 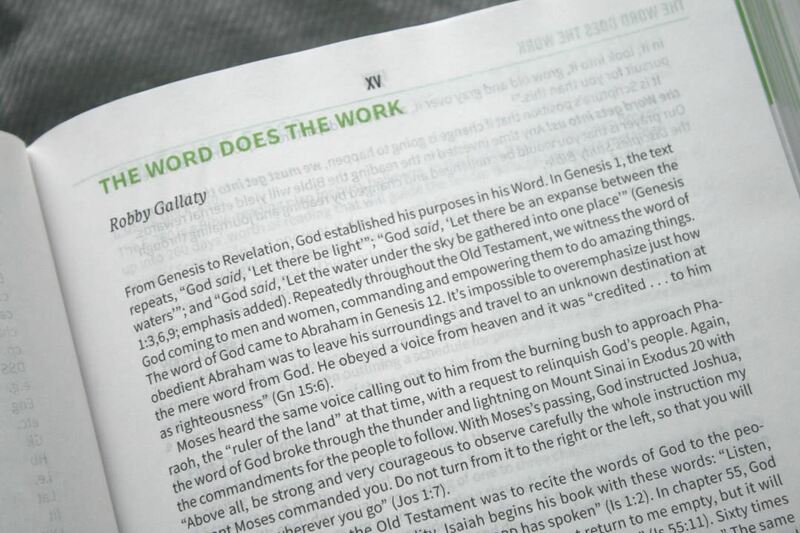 Highlight – highlight the verses that speak to you from the reading. Explain – explain what the passage means in your own words. Apply – apply what God is saying in these verses to your own life. Respond – respond to the reading. 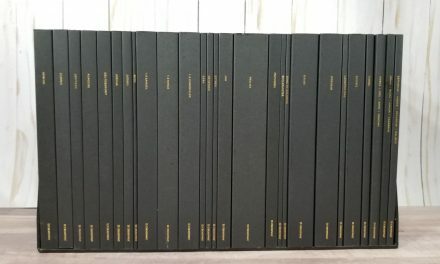 Each of these is an entry within the journal pages that are placed throughout the Bible to create 5 studies per week that follow the week’s reading plan. 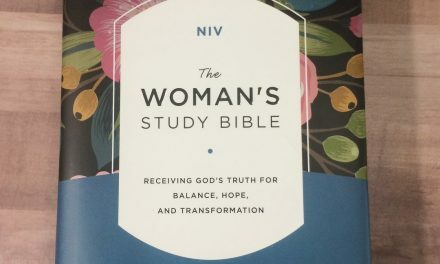 Studies include memory verses (the same memory verses from the reading plan), a paragraph that covers the topic of the reading, and lines to write your H.E.A.R. answers. The first journal entry for the week includes lightly printed text with questions to help you get started. The HEAR system does seem like a good way to study the Scriptures. 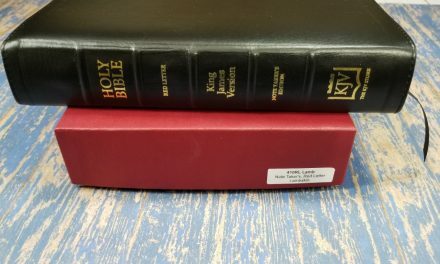 It’s systematic in it’s approach with the goal of having the reader think deeper about the text and write what they think rather than answering theological questions from one point of view. 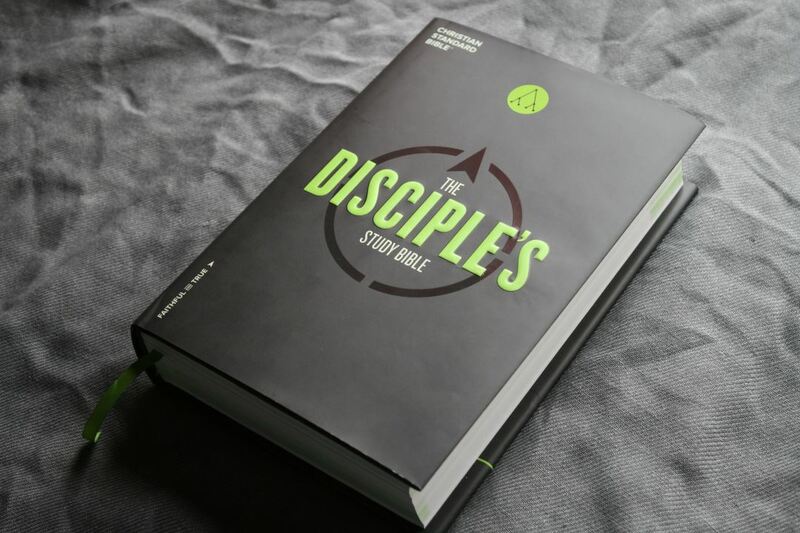 There are several pages of articles and tables to lead you through the act of disciple-making. They start with a set of acronyms. Personally, I’m not a fan of acronyms. I usually can’t remember what they stand for and it’s not a good learning method for me. Those that it will work for will appreciate the number of them and how they’re handled and taught. Following this is a set of articles about character, Spiritual fruit, praying for others, congregation, community, discipling men, women, and children, being missional, accountability, etc. I found the articles to be informative and a great place to start for the intended audience. 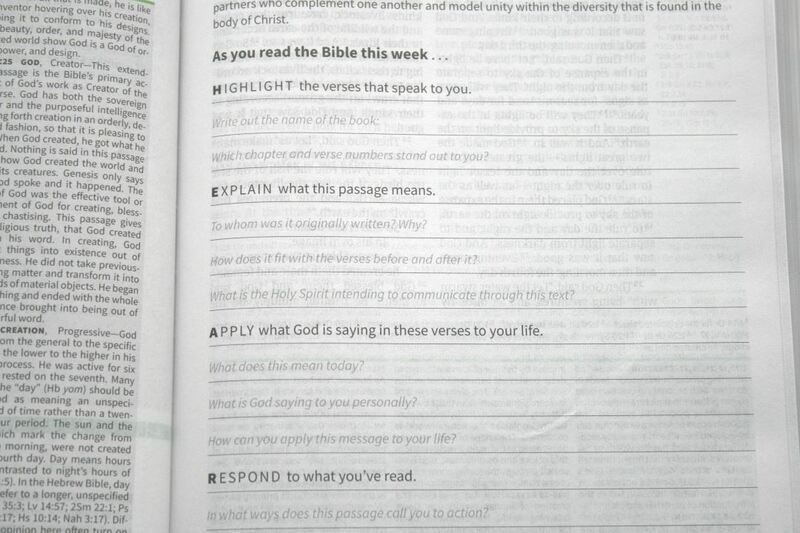 I especially liked the articles that teach about Bible study and interpretation. A list shows the memory passages, which includes 2 passages per week for 52 weeks. 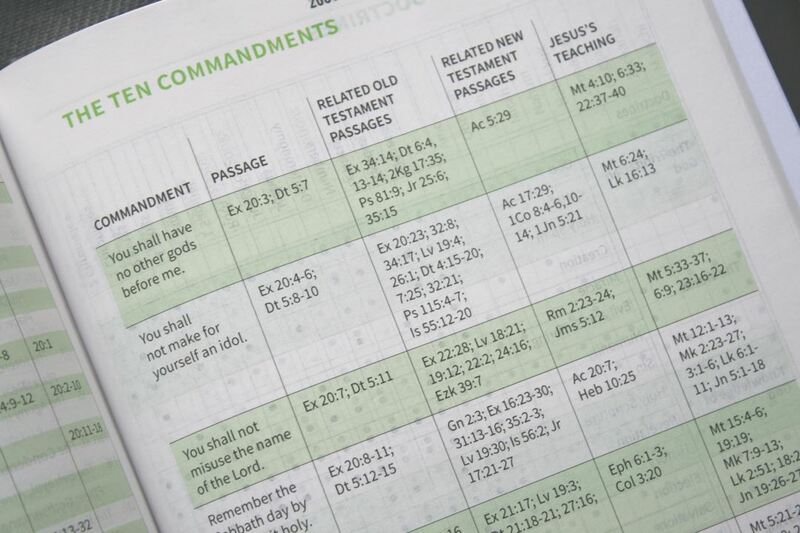 The Harmony of the Gospels lists 166 points and gives the references for each of the Gospels. Another table shows the Ten Commandments, providing the commandment, passage, related OT passages, related NT passages, and Jesus’s teachings. There are several tables of doctrines including general doctrine, those related to parables, and the doctrinal emphasis in Jesus’s miracles. The concordance is 52 pages and displays entries in three columns. There are a lot more references here than I expected. They also provide some biographical information about people. 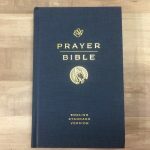 I found it to be an excellent concordance for basic study and sermon prep. 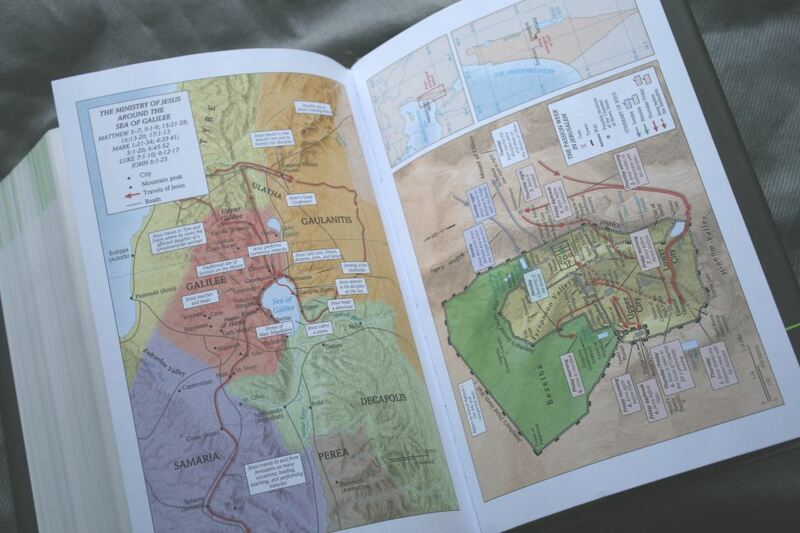 It has 8 maps on thick non-glossy paper. They’re colorful without looking cartoonish. They include cities, routes, distance, topography, mountains, Scripture references, the location on a globe, roads, territories, events, etc. There isn’t an index but they’re labeled well. I found them easy enough to use. 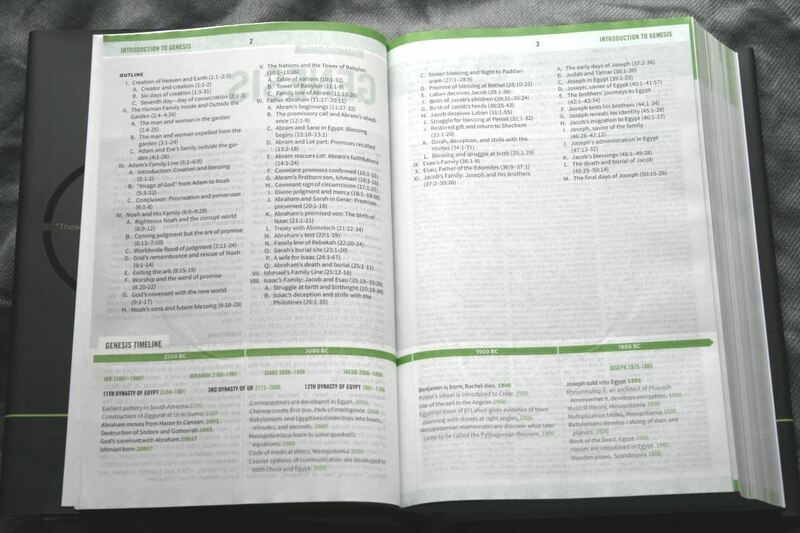 The CSB Disciple’s Study Bible is an interesting edition. 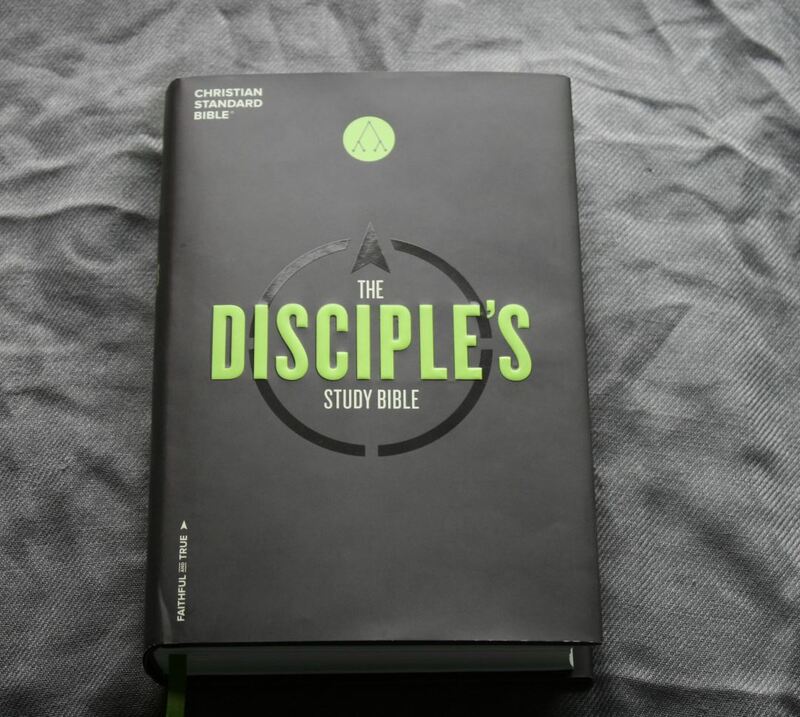 I like that it focuses on discipleship, but then gives you space for answering questions yourself rather than just giving you commentary. 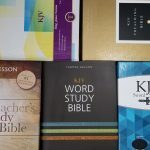 It does include topical commentary and several excellent articles on discipleship to help you study, but the focus is on the reader learning to study and learning about the Bible through that study. 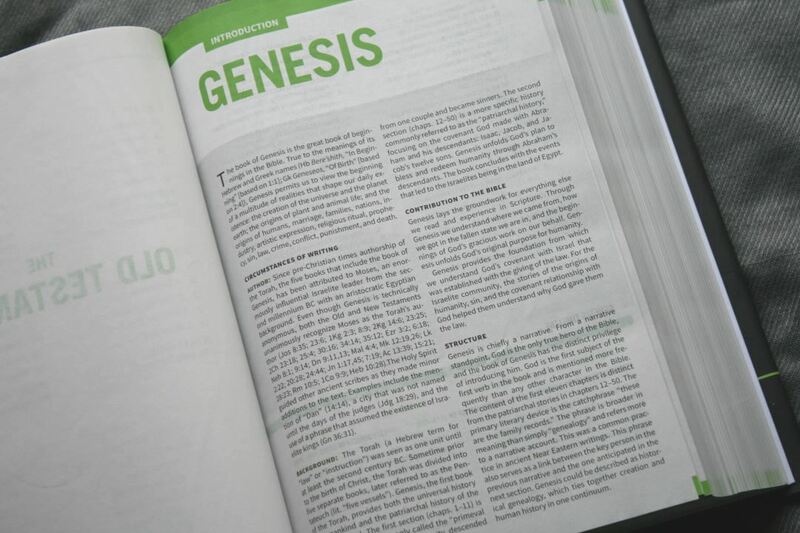 The methodology works well and is my favorite element of this study Bible. There are a lot of notes. They sometimes include multiple views (which I prefer). Other times they have more of a devotional quality. 2K/Denmark’s design is excellent, as always, with a focus on the text even with half a page filled with notes and references. The paper is thin but opaque, the typeface is clear, and the construction is top-notch. 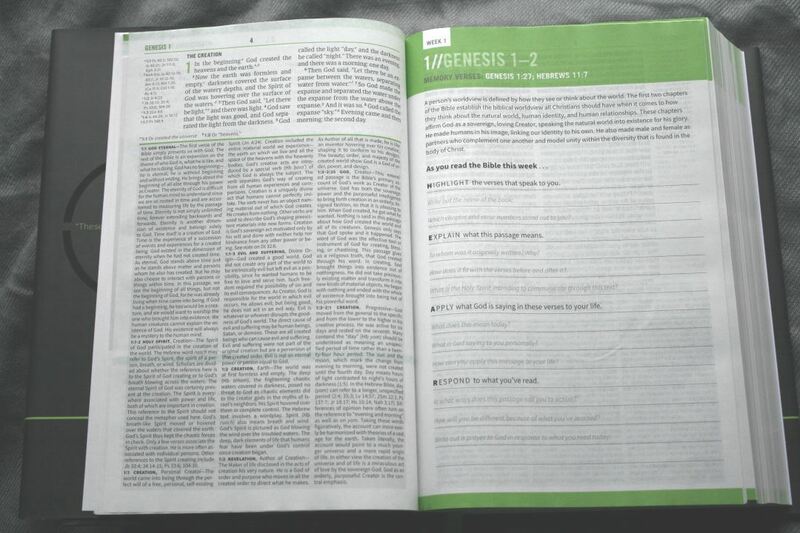 I’m not a huge fan of commentary in study Bibles but I am a fan is study systems that get the reader to dig into Scripture and study it for themselves, which is something this Bible excels at. In my opinion the H.E.A.R. 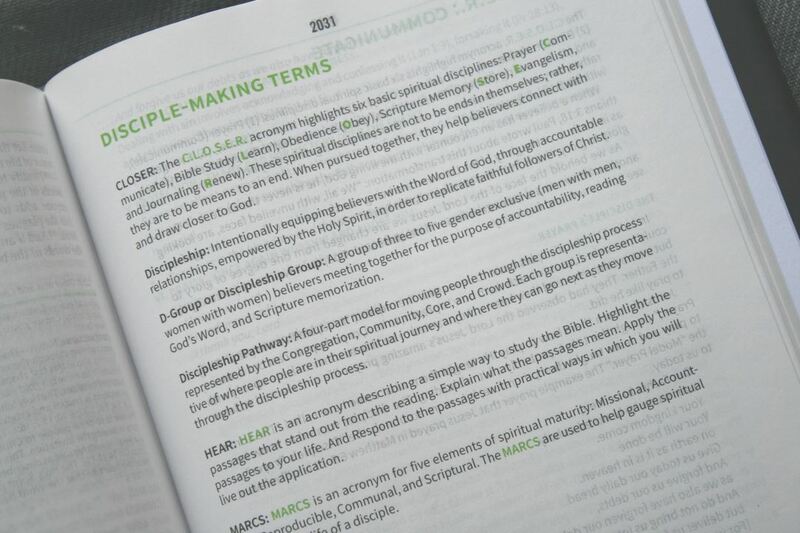 study system alone makes the CSB Disciple’s Study Bible a worthy choice.